I had the opportunity again to run some e-Textiles workshops at Yatton School as part of their Learning College programme. This time I had twelve children – a mix of boys and girls from Year 4 to Year 6. 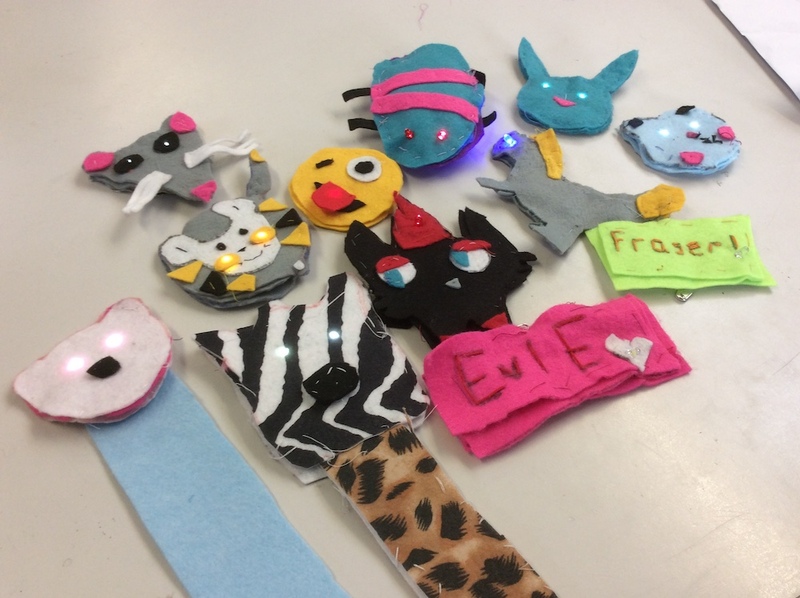 The brief for the children was to make a project with felt… and it had to have at least one LED that lit up with a switch. I showed the children some examples, which they used as inspiration. However, most of the children decided to make something different and we then embarked on a project that had to be designed and executed over four 90-minute sessions. The children had to think very carefully about their designs and how the electronic components were going to fit perfectly. This thought process wasn’t easy, but once the children understood the constraints of their design, they were great at adapting them. Once the design was put into the fabric, it was time to think about the electronic circuit – an opportunity to learn about electricity and basic electronics. Only a handful of the children had ever done any sewing before, which meant they had to learn the basics before embarking into sewing their electronic circuit into their fabric. With the electronic circuit in place, it was time to put the final touches to their projects… with a little bit more sewing needed to finish off their designs.